Chris Powell, Managing Editor of the Journal Inquirer Newspaper. Managing editor of The Journal Inquirer in Manchester since 1974, Chris Powell has been a fixture in the Connecticut media for decades. A popular columnist — and frequent critic of state government — Powell, 67, announced recently he would retire at the end of January, closing a career in journalism that spans five decades. Powell began his career in newspapers in 1967 writing features and working in the pressroom for two weeklies — The Rockville Journal and The Inquirer of South Windsor — one year before they would merge into the Manchester-based daily, The Journal Inquirer. He and his wife, Donna, live in Manchester. 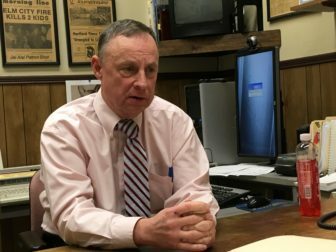 In this Sunday conversation, Powell spoke with The Mirror about his career, his brief venture into Connecticut politics, and changing trends in the Connecticut news media and state and local government. How has the news industry and the news-consuming audience — especially in Connecticut — evolved during your five decades in the business? There’s a lot less of it. I mean, there’s virtually no radio news anymore except for WTIC, which still does some original reporting. I guess there’s a lot more talk radio. The television is, I guess, more pervasive and yet more trivial. Fires, crashes and weather every 10 seconds. I don’t know how the hell they pull it off in the summer when, day after day, it’s sunny and warm. Why do you believe people are not consuming news, in any medium, at the same rates they used to? First, I think civic engagement and literacy are collapsing. Back in the ‘50s and ‘60s my father was on the Board of Directors [Town Council] here in Manchester and I would go with him on election night to Democratic headquarters. I would always pick up a copy of the sample ballot. I still have in a file at home a sample ballot for the October 1962 town election. … I compared those vote totals against the 2015 or 2017 town elections recently in Manchester and discovered more people voted in the 1962 town election than voted in the recent town elections in Manchester. In fact 40 percent more people voted in the town election in 1962 than have voted recently, even though the town’s population is 40 percent larger. To me, voter participation is a key measure of civic engagement and it’s collapsed. We did a survey here two years ago. … We determined that probably 25 percent of the eligible adults in Connecticut don’t even register to vote. When you hear two-thirds of the voters voted in the presidential election, you have to knock that down by 25 percent. When you adjust the voter participation numbers for people who are eligible but don’t register, I think you find that half of the state’s not voting in a presidential election, two-thirds is not voting in the state elections and probably 85 to 90 percent is not voting in the municipal elections. Well, you know, that’s a pretty sad measure of civic engagement. … I think it’s all in the corruption of prosperity and demographics. People assume that government’s going to run itself. It doesn’t. At the same time, news organizations are losing resources. Their staffs are getting smaller and less experienced, and more organizations repackage news or provide commentary only rather than original reporting. Is there any way to break this cycle? I think 15 years ago I got invited to speak at a journalism seminar at Southern [Connecticut State University]. When I got there, the journalism professors were very proud of a civics course they had established that they were making mandatory for journalism majors, because they had found that their aspiring journalism majors were so ignorant they could not identify the three branches of government. I began to wonder, how do you get out of something calling itself a high school in Connecticut and how do you get into something calling itself a university and not know what the three branches of government are? …Nobody has to learn anything to get a high school diploma. It was all in Judge Moukawsher’s decision last year, that we’re graduating functional illiterates. One of the recurring themes in your columns over the years has involved personal responsibility. You write about the tremendous resources government has to dedicate to people who have children before they are ready to care for them. It seems to go back to the issue of Connecticut’s disengaged electorate? I don’t hold them responsible. I hold the government responsible. It’s the government money that makes it all possible. These things wouldn’t happen unless the government was going to subsidize them. I mean, people are not stupid. They react to the financial incentives the government gives them. And we tell people if you don’t get an education and can’t support yourself, well, that’s OK, you can have all of the kids you want outside of marriage, that you can’t support yourself, and government will give you a welfare stipend, Medicaid, food stamps and Section 8 vouchers. You’ve also written a lot of columns about what you refer to as the “government class” in Connecticut, the public-sector employee unions. We require government employees to be unionized. We require the government to bargain collectively with them. We require the government to subject itself to binding arbitration. In effect we’ve taken the great bulk of government expense out of the ordinary democratic process. I was joking with [WTIC AM-1080 talk show host] Ray Dunaway this morning that a few hundred years ago we had a system of binding arbitration where all of the great financial issues of government were removed from the democratic process and settled by an unelected arbiter. It was called monarchy and we fought a revolution against it. Now we’ve pushed ourselves back into this undemocratic system where the public cannot control its primary expenses. Now we’re looking at projections that state finances will be under severe pressure for the next 10 to 20 years as Connecticut grapples with severely underfunded retirement benefit programs for state employees and teachers. They [state officials] knew that this was coming. Labor itself knew that it was coming. … The highest aspiration in Connecticut was to become a fixed cost. Now the fixed costs are all that we can afford. I can’t remember a time when … someone wasn’t reporting that we have 2,000 mentally impaired adults living with their elderly parents for whom there are no group homes in the state. This is a basic function of humane government. These uncontrollable personnel costs are cannibalizing the government. … The money is the secondary issue. The primary issue is the democracy. The elected officials don’t want to get caught between the taxpayers on one hand and the government employees, the most fearsome special interest, on the other. How have you seen the political landscape change over the past 50 years. What other trends have you noticed? I think we’re less competitive politically on a local and district level. Maybe we are changing some now that we’re going down the toilet so fast. But Connecticut used to be, back in the ‘50s and ‘60s, a politically competitive state. We’ve gotten more Democratic since then. … Politics are generally liberal. 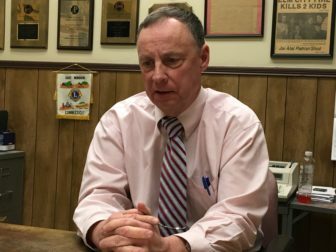 Can you talk about your decision in 1992 to accept the Republican nomination and run for state Senate in the 4th District against Glastonbury Democrat Michael Meotti. It created quite a buzz. You had a journalist, who, as managing editor, was running a newsroom and running for a public office in your coverage area. I gave up the managing editor’s job [during the campaign.] I wasn’t supervising anybody. … They couldn’t give the [Republican] nomination away. Nobody was going to challenge Meotti in a Democratic district. A few people suggested me and I agreed to do it, well, out of civic duty. I got the same measly share of the vote — 40 percent, rounding up — that all of the Republican challengers of Democratic incumbents got that year. And that was that. Returning to journalism, throughout most of your career you have always tried to balance overseeing news coverage — as managing editor — while also writing opinion pieces, as editorial page editor or as a columnist. Some traditionalists hold these two functions of journalism need to be kept separate. Has that been a difficult line to walk? Not for me. I’ve always believed the selection of every news story is a political act. Everybody operates from his politics in the most general sense. News is what anybody thinks it is. I will look at something and think it is big news and you may think it is nothing. Or vice versa. It’s not arithmetic. It’s a judgment on what the public interest is. People have different views of that. Can you talk about your definition of news and the philosophy you’ve wanted the JI to follow. You’ve cited someone before saying that when it comes to government, for example, an action doesn’t have to be illegal to be newsworthy. Somebody said “news is what somebody doesn’t want published.” I may have cited to you Charles Peters, retired editor of The Washington Monthly. He was from West Virginia, and things are pretty rough there. He said the scandal is never what’s illegal, the scandal is what’s perfectly legal. I think he was usually right in that respect. I know from a number of things that government has set things up — very carefully sometimes — to make sure that a morally corrupt system can be sustained without legal challenge. They know what is objectionable, and they’ll set it up to be completely legal. 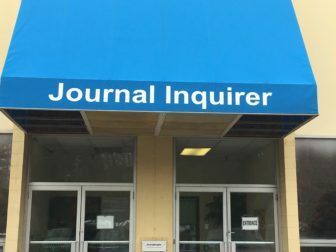 What’s been most important to you in terms of the JI’s reporting and what it’s accomplished over the years? I think the paper has democratized power a little bit on the local level. At least if the paper was around there was an opportunity for those who were aggrieved to get their view out and try to hold power to account. The paper did a lot of reporting on the scandals surrounding former Gov. John G. Rowland, both before his impeachment inquiry and even after his resignation. Certainly the Rowland stuff was probably our biggest success. The Rowland scandal would not have unfolded if not for the JI. … Rowland’s dealings with Enron, his lying about it, his using the party credit card for personal expenses — we were writing about that all alone. I know you’ve been active for years with the Connecticut Council on Freedom of Information. How healthy are the state’s right-to-know laws and why do so many advocates say the best that can be done each year is to prevent further erosion of the system? There’s always a slow erosion of right-to-know provisions. One thing that especially bothers me is state employee unions are entitled to negotiate provisions in their contracts which constrain the FOI law, which are authorized to trump the FOI law. Certain employee records can be removed from the public purview. … To me it is the most disgraceful indication of the subservience of the government to the unions. What about the FOI rules in general? It always grows weaker. There are new exemptions to it every year. There’s always somebody who does not want the public getting into its own business. There are more than 1,000 youth courts across the country, but in Connecticut, there’s only one. As its director Jean Michaud, explains in this Sunday Conversation, Project Youth Court in New Haven uses trained teenage volunteers to run hearings for young, non-violent misdemeanor offenders. David Pickus, president of SEIU 1199 New England, appreciates the value of the care provided to the disabled by thousands of Connecticut workers. But he's not sure state legislators do. He'll be finding out in a few days, he says, when he meets with state officials to determine whether they can come to wage and program funding terms that will avert a strike tentatively scheduled for next month. President Lyndon Johnson signed the federal Fair Housing Act on April 11, 1968. Fifty years later, discriminatory lending and rental practices persist, as the Connecticut Fair Housing Center discovered sending fair-housing testers out to pose as renters or homebuyers over three years ending in 2015. Our Sunday conversation is with Erin Kemple, an attorney who lives in an integrated Hartford neighborhood and is executive director of the center. Connecticut State Attorney General explains why he and other state attorneys general from all over the country are demanding answers from Facebook about the data breaches soon to be addressed by Congress in hearings Tuesday and Wednesday. Statewide, there has been little progress in stemming aggressive student behavior as student suspension and expulsion rates steadily decline. For this Sunday Conversation, we sat down with Tod Couture, a special education teacher from Enfield, to talk about school safety in a district that is focusing its resources on another safety issue: student assaults on teachers.